Hangzhou was settled as early as 4, 700 years ago, thus giving birth to aurora Liangzhu civilization, one of the seven ancient capitals and the key scenic tourism historic and culture city in China. Famous for its west lake, once was applauded as the "most splendid city in the world " by the famous Italian traveler Maco Polo in the 13th century. ● absolutely no any forced shopping places,when traveling with us, you will experience a REAL Hangzhou trip . 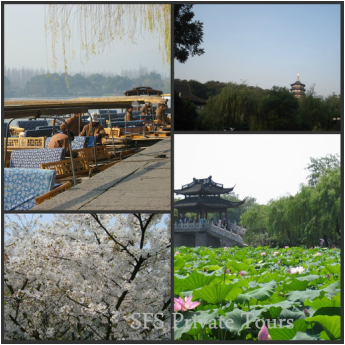 SFS offers various tours in and around Hangzhou . We are also happy and flexible to tailor-made any unique tours to cater different customer needs. If you are coming as group travelers, private minivan/coach are also available, please contact for detail quotes. The private guide will pick up you at your place/hotel then take the fast train to Hangzhou( about 70 mins)- You will experience the most advanced train ride in China. West Lake(Xihu) : Locating in the western area of Hangzhou city’s historic center, it is original a shallow sea inlet, due to lying down of silt. It is surrounded by three Sides Mountains, with the total areas about 6.7square Km (1404 acres), average depth 2.27m it is the most famous lake in the world, the famous Song dynasty poet Sushi, compared the lake to Xizi, one of the most beautiful lady in ancient China. It is one of the largest and wealthiest Buddhist temples in China, and contains numerous pagodas and Buddhist grottoes. It was constructed in 326 AD. Near the entrance of the temple, there is the famous Buddhist grotto, called Feilaifeng, meaning peaking flying from afar. It is one of the four most famous renowned tea plantations in Hangzhou for producing the dragon well tea and a great place to learn the local tea history and culture and meanwhile enjoy the beautiful countryside scenery.